The Zodiac iAquaLink 2.0 Network Interface Module. Used on newer systems from the year 2007 and newer with software revision R and newer. Finally an iAquaLink product that works well. I had the first iteration product and every year when the pool opened had to spend extra $ for the pool service to figure out why it wasn't working. Version 2.0 works well - seems to have better internet connection, can program via iphone (as opposed to schlepping out a ladder to remove the first generation version and hooking up to a computer when it wasn't working). This one is so far quite reliable (fingers crossed for the rest of this season and future seasons). Works great. Control pump, heater, cleaner, lights, and water features from your phone. Awesome. This unit was a good upgrade for the older one I had that decided it didn't want to connect to wi-fi any longer. Great price and FAST shipping!! Q: Is this the newest version?? 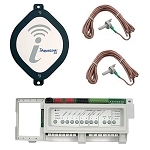 Q: Zodiac iAquaLink 2.0 IQ20-A Network Interface Module - is this a direct replacement for IQ900? Q: I have an RS Model 6613. Will it work with iAqualink 2.0? If not what would I need to make sure it works? Thank you.